Prices declined 5.6 percent in May from a year earlier and rose 0.9 from April, the Federal Housing Finance Agency in Washington said today. Economists expected a 0.2 percent drop for the month, according to the median of 16 estimates in a Bloomberg survey. 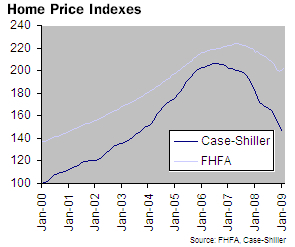 Below is the month-over-month price index from FHFA. 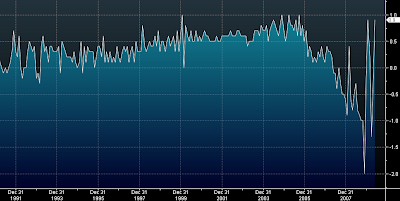 The index has been highly volatile recently, showing a rapid overall depreciation. But one may interpret the recent data as a possible stabilization in prices. Of course this index has been challenged before because it may not be constructed from a fully representative sample. This chart from the WSJ shows the comparison to the Case-Shiller index. But what if there is something to this housing price stabilization? Is it possible we are at the bottom of the first dip in the "W" type recovery? An intriguing article was recently written by MIT's William Wheaton, who argues that net new household formation will soon create significant demand by using up existing inventory in the housing market. That demand may be sufficient to stabilize prices and stimulate new construction. It's a matter of demographics. At that rate, the current excess inventory of units for sale or rent will be back below normal by 2011. Prices historically have a strong relationship with sales “duration” – the ratio of inventory-to-sales. Hence under reasonable conditions, in two years we will have to increase construction considerably and prices will have to justify the cost of that construction.